A challenging and fun activity for students and group play. Helps develop coordination, cooperation and confidence. Set up as a disc golf game, 9 hole course or target hoops. 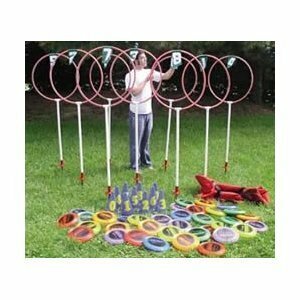 The 9 target outdoor set includes 9 each numbered targets (with 48" center height), 36 each 95 gram discs, 9 each numbered cones and 9 each steel ground sockets. Also includes a heavy duty carry bag to store and transport the entire set. You may also buy a 3 hole set listed below (the 3 hole set gets plain orange cones instead of blue numbered cones). Ships via UPS.